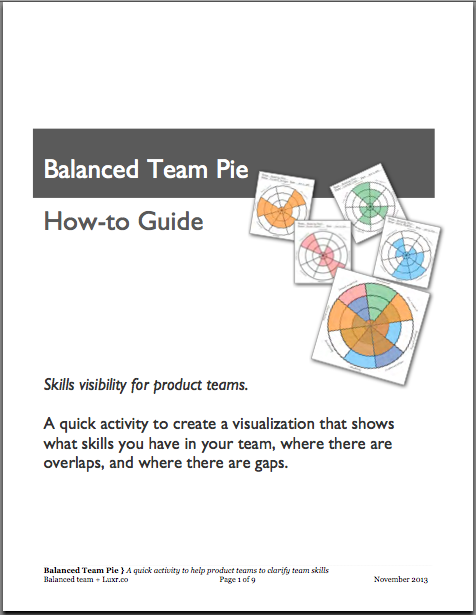 The Balanced Team Pie is a quick activity to help product teams see what skills they need and what skills they have. It’s short, easy and actually kinda fun. 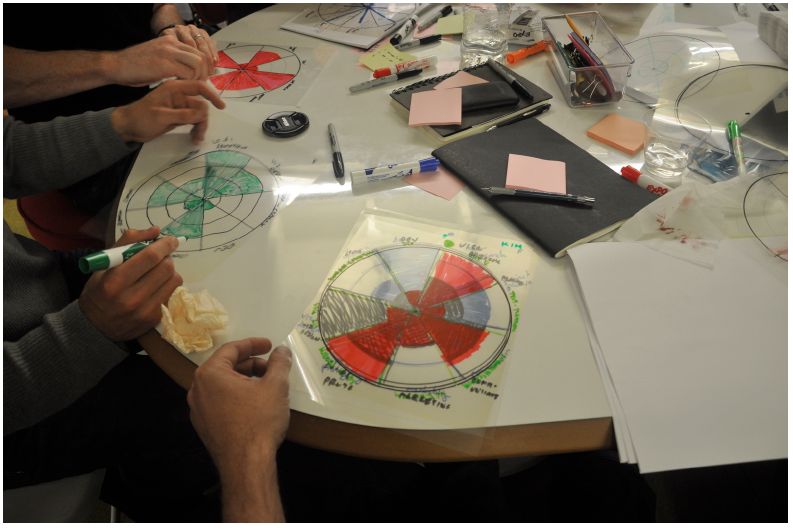 In the activity, you create a visualization that clearly shows what skills are present in the team, where there are overlaps and where there are gaps. When you can clearly see the gaps and overlaps in your team, you’re able to make smart choices to fill gaps and make the most of shared skillsets. Identify key areas of competency needed by the product team. Get to know the skills & expertise of team members. See where team skills overlap and identify gaps to be filled. A visual overlay showing the distribution of skills in key areas important for product success. Clarity in roles & expertise of team members. Clearly identified gaps in skills. You can download the complete How-to Guide & template, or keep reading for details. Follow-up discussion can take up to an hour, but doesn’t need to happen in the same session. Team pie template, printed on white paper. 1 copy per participant; 1 copy for the facilitator. Team pie template, printed on clear transparency film. 1 copy per participant; 1 copy for the facilitator. Note: The clear film is super-important. It’s what makes the activity work. The Reveal! The density of color will show you where the team has overlapping skills. Lighter areas show where the team has some skills. Open areas are gaps in the team. On the clear transparency film Team Pie Worksheet, use the red whiteboard marker to fill in the areas that are open gaps. Label this as the “Gaps” pie. Key skills that are missing or underdeveloped. As a team, discuss the areas of overlap. These show shared skillsets. This is a good time to identify roles and responsibilities to clarify areas where there may be competition or conflict. 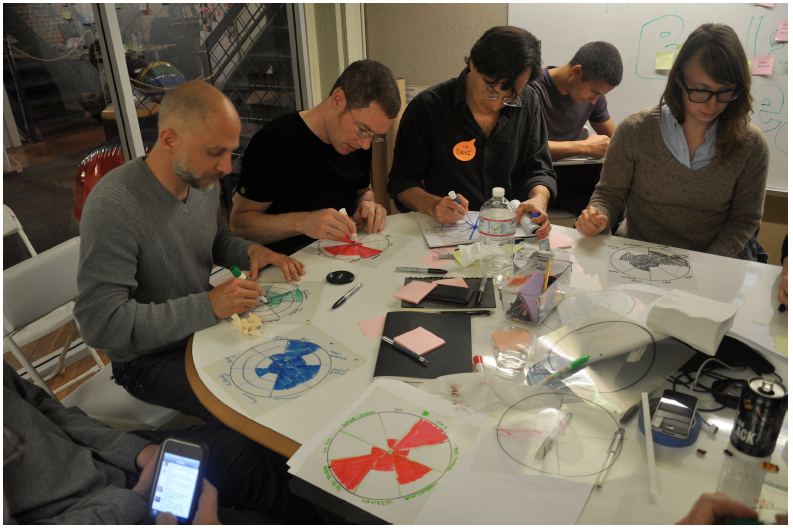 Overlapping skill areas are fruitful areas for collaboration and pairing. Are the team members with these skills able to collaborate effectively? What benefit does the team derive from shared skills, and how can we capitalize on this to be successful? Are there areas of responsibility, accountability and authority that would be helpful to clarify further? Next, identify areas where coverage is thin and doesn’t extend out to the outermost ring. These are skills are present but not mature. How critical is expertise in this area? Lastly, identify slices that are completely clear or where coverage is thin and only extends as far as the 2nd ring This is the area of significant gaps. 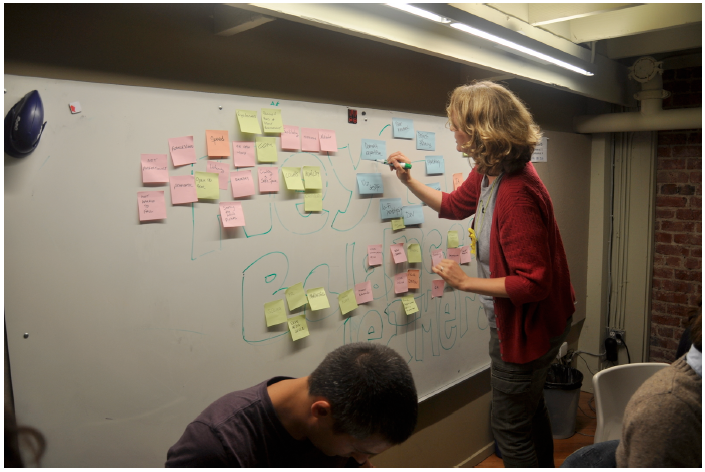 After the discussion, capture the tasks to follow up on as a list for next steps. 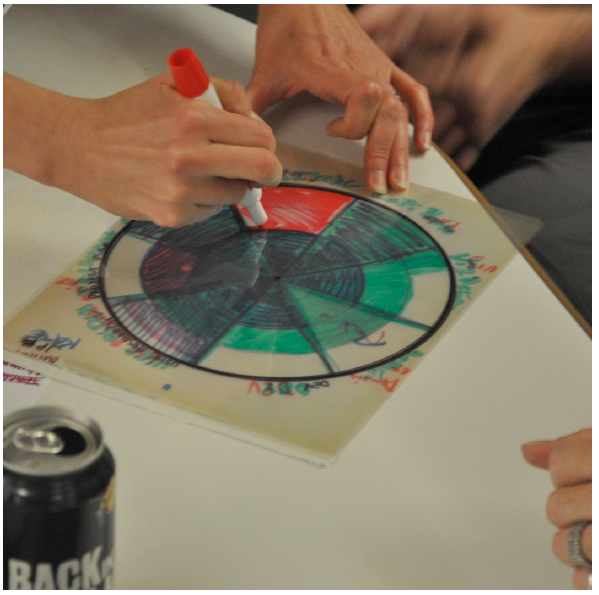 Take a picture of each individual pie, the overlay team pie, the gaps pie and the next steps. Be sure to put a date on them. Check back in 2-3 weeks to see what has changed, and if the follow-up steps are on target. It’s helpful to do this activity once a quarter to see what changes and what new skills and competencies are emerging. You can get clear acetate or transparency paper in most office-supply stores and online at amazon.com. It’s available for ink-jet printers, laser-printers and copiers. It’s about $25 for 100 sheets. Many local copy shops carry it as well, and you can buy it by the sheet. 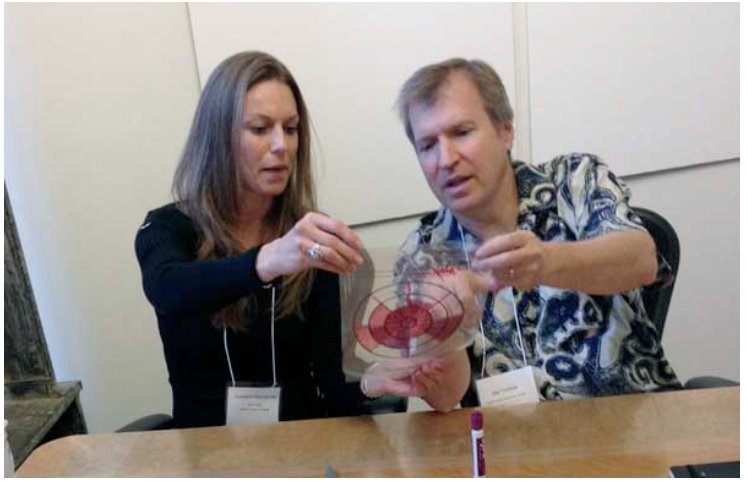 These photos are from the workshops at the Balanced Team conference in 2011 and 2013. 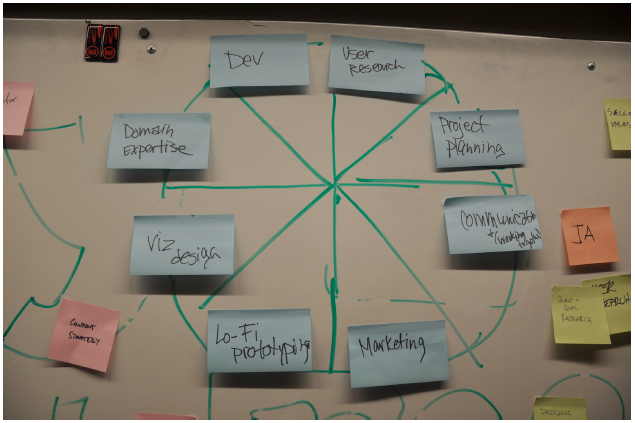 Examples of competencies on stickynotes. Filling out the skills pies. Filling out skills pies and comparing them. Comparing the pies as a team. Questions, comments or improvements? Leave a comment and share your ideas. Unfortunately, all the links to the How-to Guide & template on this page return a 404 not found error. Can you have a look? Hi Philipp: I just fixed the links and all should be back in good order. Thanks for the quick heads-up! Thanks, Kate for sharing. I’m gonna use this for coaching! This activity would fit so well in the Alignment element of Agile Chartering that Ainsley Nies and I describe in our book, Liftoff: Launching Agile Teams and Projects. What a great way to help a team think about the skills they’ll need, appreciate the importance of cross-functionality and generalizing specialists, and more. Thank you for this!